This safari takes you to Tarangire National park for a whole day, almost two days in the Serengeti and one whole day crater tour in Ngorongoro. 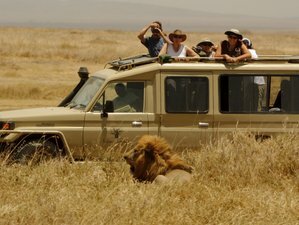 The safari takes you around the best places in Tanzania, visiting places such as The Ngorongoro Crater which is known also as the Garden of Eden, and Serengeti National Park. The accommodation takes place at the campsite when you are in safari. You'll also get one night's accommodation at Arusha Tourist Inn before safari and a day room after the safari. Tarangire's public campsite is just a short drive into the park near the northwestern tip. It has a good bush location and simple cold-water facilities. Bring supplies from Arusha. The public campsites which are collectively called Seronera Campsite are located in the Central Serengeti area known as the Seronera. Seronera Campsite is one of the most famed campsites in Tanzania for animal encounters. Animals will pass through the campsite at night on their nocturnal wanderings. This campsite is guarded. Tents have mats and bathrooms are outside of the tent. Simba Campsite lies on the very rim of Ngorongoro Crater and has an excellent view across the caldera. A fantastic sunrise over the crater rim opposite makes a fine breakfast scene. Often there are elephants wandering around the camp! This campsite is guarded. Tents have mats and bathrooms are outside of the tent. Facilities at Simba Campsite are basic but this is more than made up for by the atmosphere of this camp in the clouds. Today, you will be accommodated in a hotel in Arusha. After an early breakfast, you'll proceed for a full day game drive at Tarangire National Park with picnic lunches. Your dinner and overnight will be at the Tarangire campsite. After the breakfast, you'll set out for the endless open plains and stunning skies of the Serengeti. A full day game drive and late evening game drive. Your dinner and overnight will be at Seronera Public Campsite. After a relaxing morning and an early lunch, you'll proceed to Ngorongoro. Enjoy game watching on your way to Ngorongoro from Serengeti. You will arrive at Ngorongoro late in the evening. Spend the night on the crater rim at Simba Campsite A. After breakfast, you'll proceed directly to the crater floor for a full day crater tour with picnic lunches down the crater where you will be able to see all the Big Five animals. Later, proceed back to Arusha in the evening. There will be a day room after the safari. Today will be a departure day. This safari holiday will take you to Serengeti National Park, Tarangire National Park, and Ngorongoro Crater in the Ngorongoro Conservation Area, all of which are located in the country of Tanzania. During this safari, you'll get a chance to enjoy an optional visit to a Maasai village.